to receive FREE recipes directly in your inbox!! These bites are so satisfying. They have a soft creamy center covered in crunchy breadcrumbs. Plus, they are a baked! Way healthier than fried, and just as delicious. 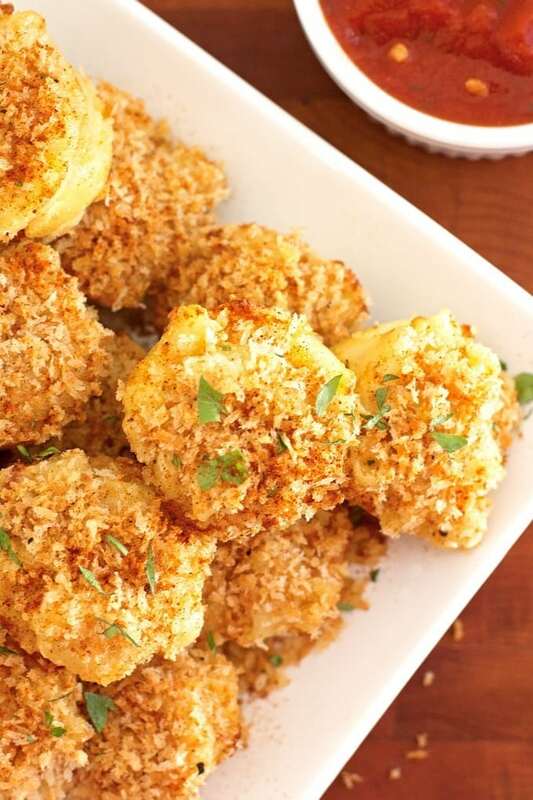 This baked mac and cheese bites recipe was inspired by my baked mac and cheese. That recipe turned out so delicious, that I decided to turn it into fun little mac and cheese bites. 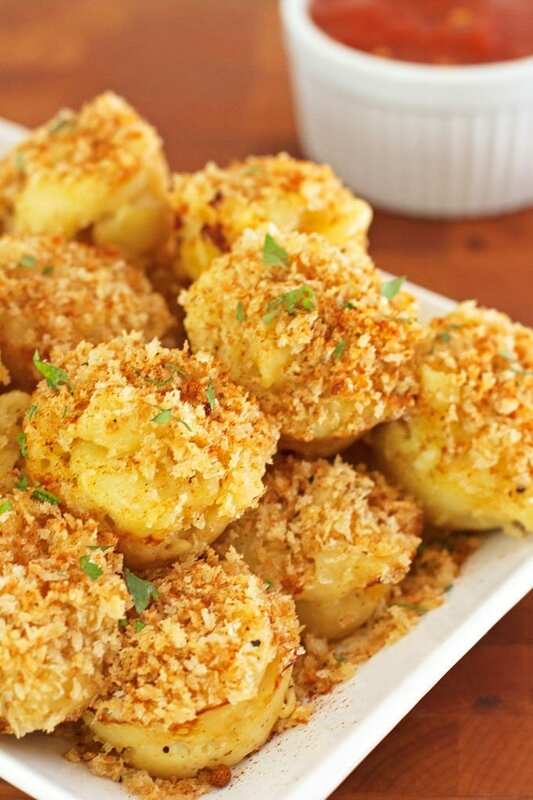 I really like the spices in this baked mac and cheese bites recipe. Nutmeg makes the sauce richer, while the mustard and cayenne pepper add just the right amount of kick to cut through the creaminess. The bites aren’t spicy, but they taste cheesier somehow. Speaking of cheese (one of my favorite things to speak about), just about any cheese will work well for this recipe. Mozzarella, Gruyere, and Provolone are easier to melt, but cheddar is always delicious. Baked Bite-Size Mac and Cheese! Boil a large pot of water on high heat. Add pasta and cook until al dente, about 8 minutes. Drain and set aside. Melt butter for mac and cheese in a large pot or skillet (one that will fit all the pasta later) over medium heat. Sauté garlic until fragrant, about 1 minute. Whisk in flour. Gradually pour half and half, then milk in, whisking constantly. Continue to whisk constantly until sauce thickens, about 10-12 minutes. Add mustard, cayenne pepper, nutmeg and salt. Gradually whisk in cheese until completely melted. Turn off heat and whisk in the egg yolk. Gradually stir in pasta and then set aside. In a large skillet melt butter for breadcrumbs over medium heat. 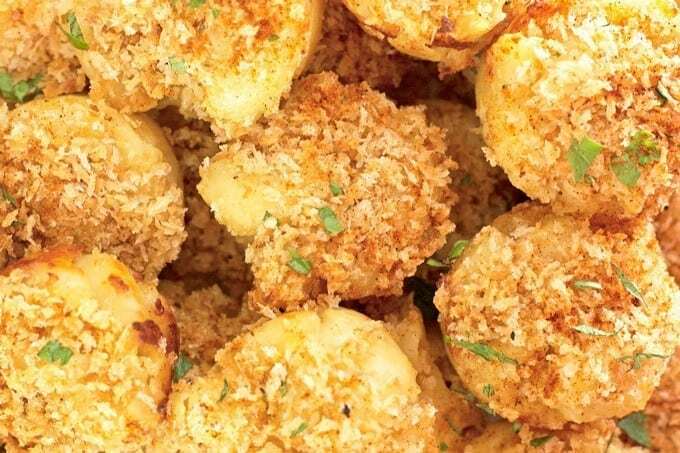 Stir in breadcrumbs and toast, stirring constantly until golden brown, about 5-10 minutes. Remove from heat and add salt and pepper to taste. Divide mac and cheese evenly into mini muffin tins, pressing down on each one. Sprinkle with bread crumbs. Bake until golden brown and heated through, about 10 minutes. Let sit in muffin tin until they can maintain their shape, about 10 minutes. Sprinkle with optional parsley and paprika. Enjoy! Hi Darcy, thanks for reaching out with your question. I’ve never tried freezing these, but I don’t see why it wouldn’t work. I would follow the recipe through to the end, then place them in a single layer on a cookie sheet in the freezer until they are completely frozen. Then I would transfer them to a ziplock bag or airtight container. When you’re ready to eat them, bake them either in a mini muffin tin or a on a baking sheet until warmed through. I’d love to hear how they turn out! 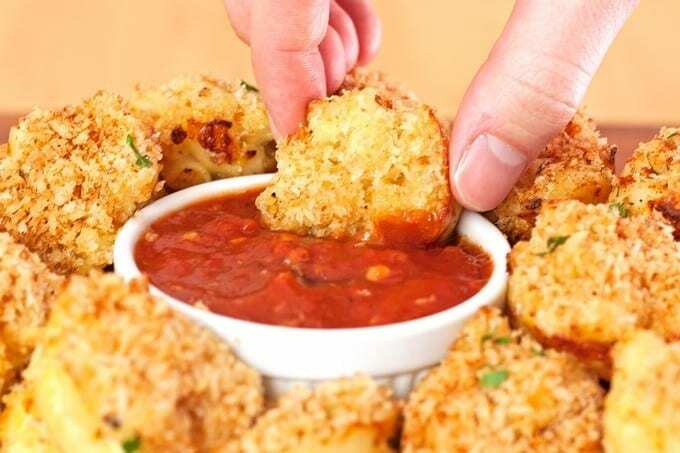 These little bites look so yummy!